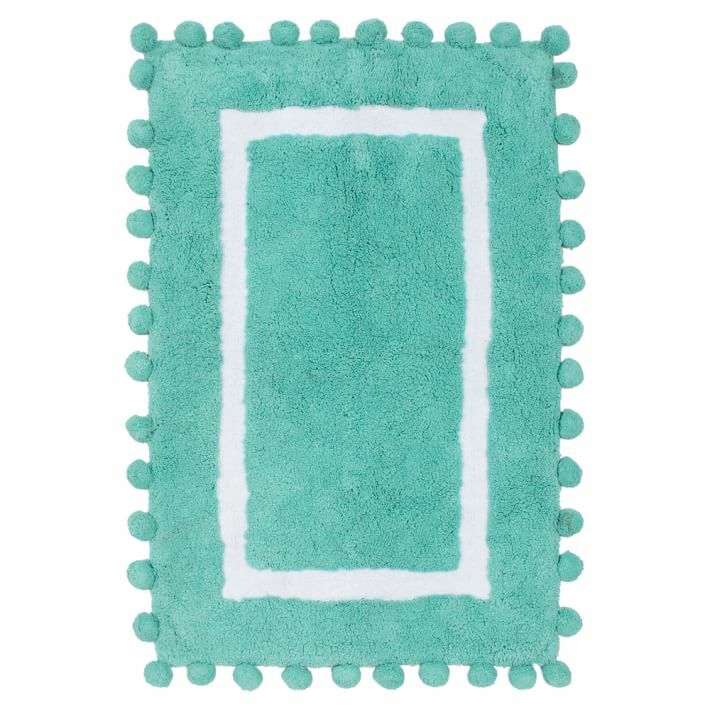 This Turquoise Tassel Jacquard Bath Rug from Studio D features a jacquard woven abstract pattern and tassel trim on both ends. Made of cotton. Machine washable. $29. Buy here. 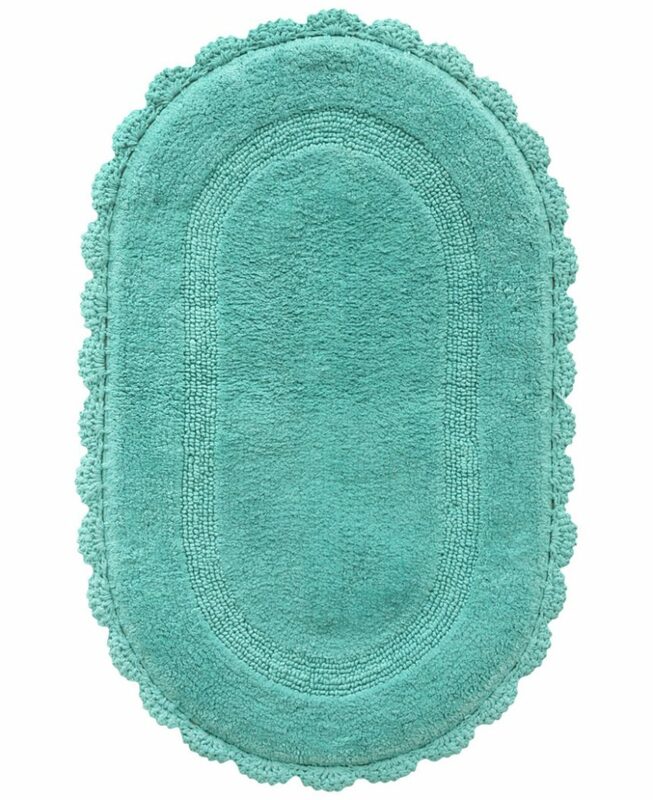 Perfectly puffy pom-poms trim this supersoft Pom-Pom Bath Mat. A mixture of cut pile heights adds dimension.100% cotton. Machine washable. $29.50. Buy here. 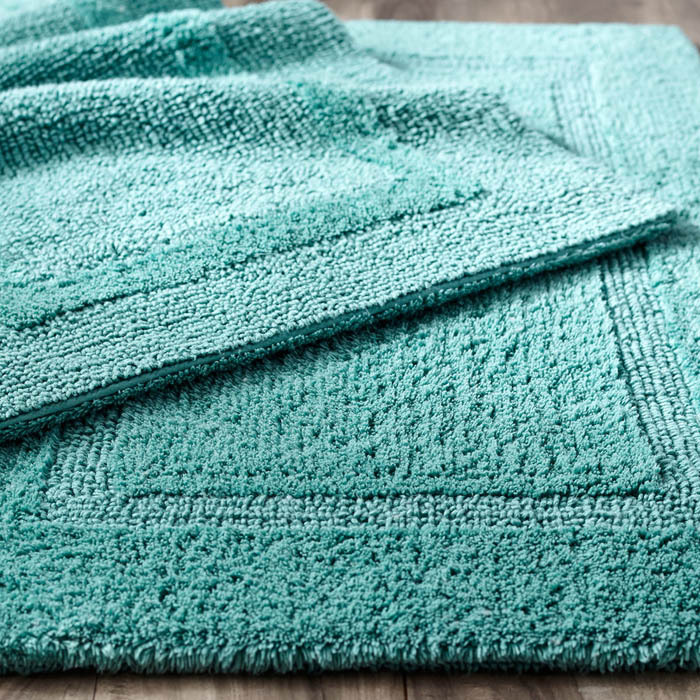 Tufted and textured with a high-low looped pile, this plush Aqua Sea Carlin Accent Rug adds an inviting accent to any bathroom. A finely scalloped border finishes the rug a stylish edge. $54. Buy here. 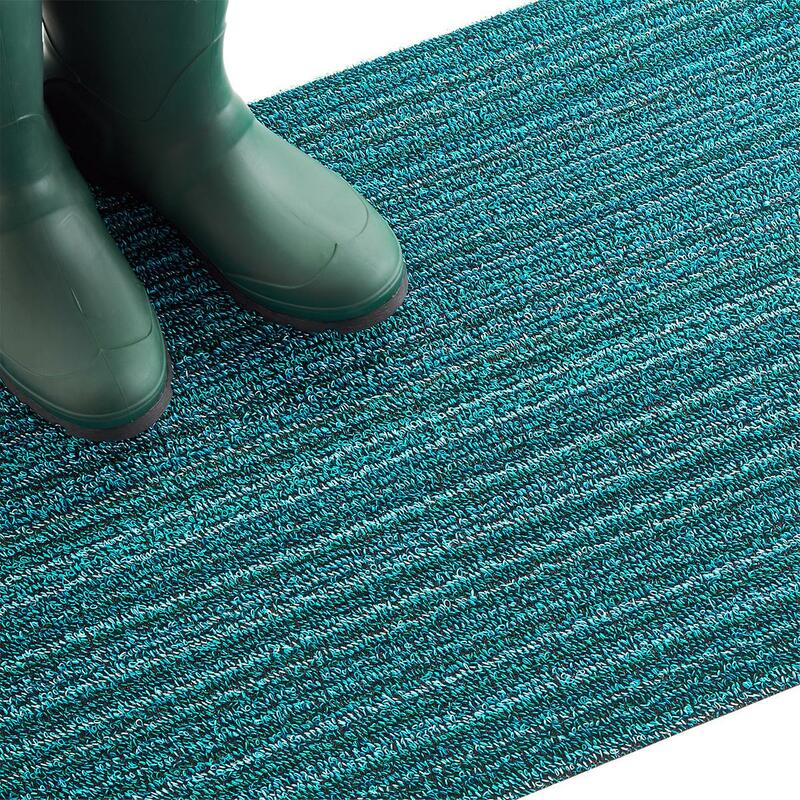 These Chilewich Turquoise Skinny Stripe Mats are made by tufting custom yarns as loops onto a primary backing and then binding them onto a hardworking vinyl that can stand up to any weather. 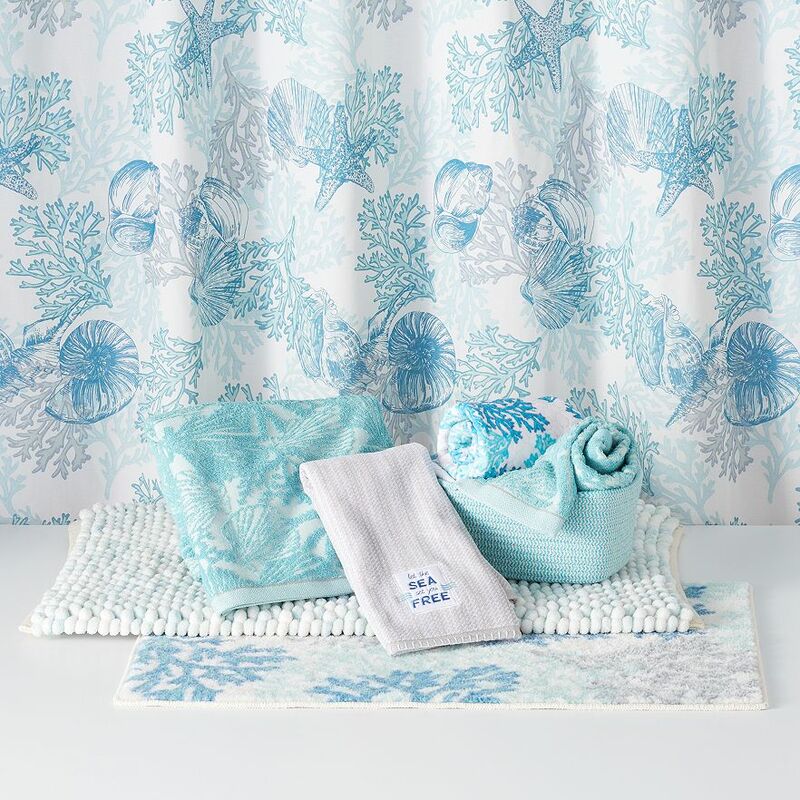 They’re ideal for bathrooms, outdoor terraces, pool areas and entryways and are a breeze to clean. $50. Buy here. Keep your bathroom looking fresh and clean at all times. 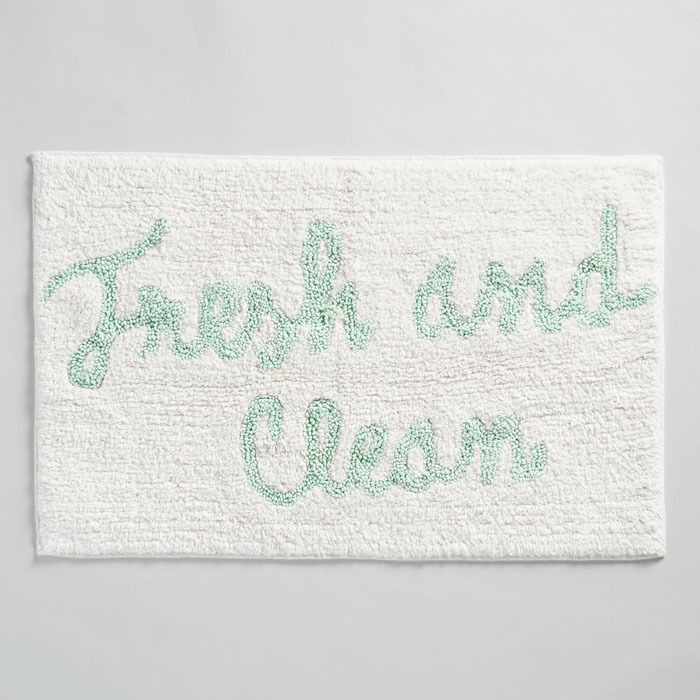 This Fresh and Clean Tufted Bath Mat features a fun “Fresh and Clean” cursive print in ivory and mint for a charming look. $14.99. Buy here. 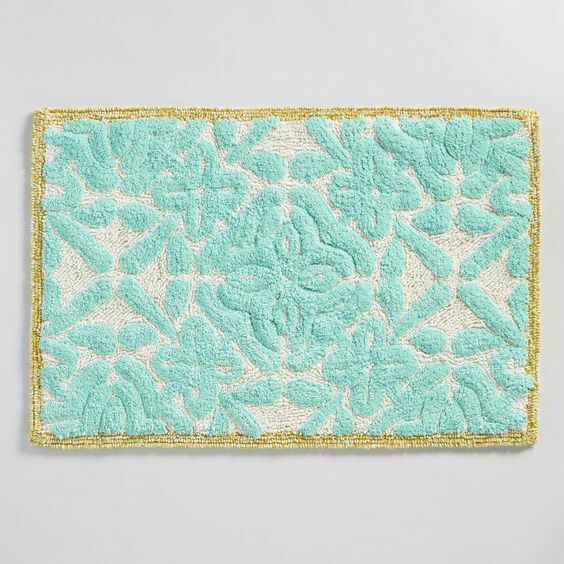 This cottonÂ Aqua Floral Tile Tufted Bath Mat features a tile design in a contemporary aqua shade with green trim on an ivory background. 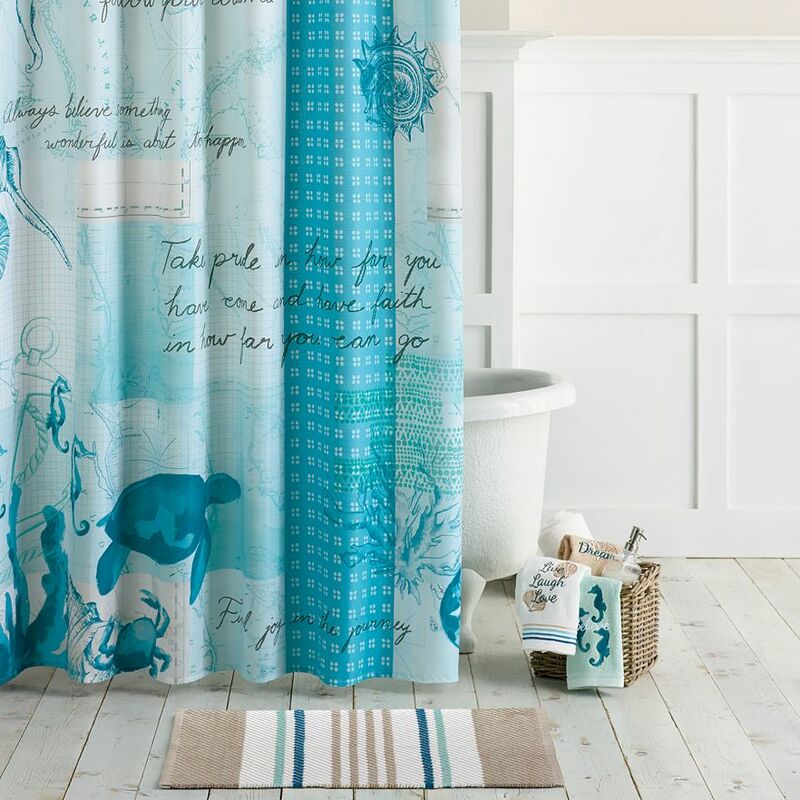 It adds a cool pop of color to your bathroom. $16.99. Buy here. 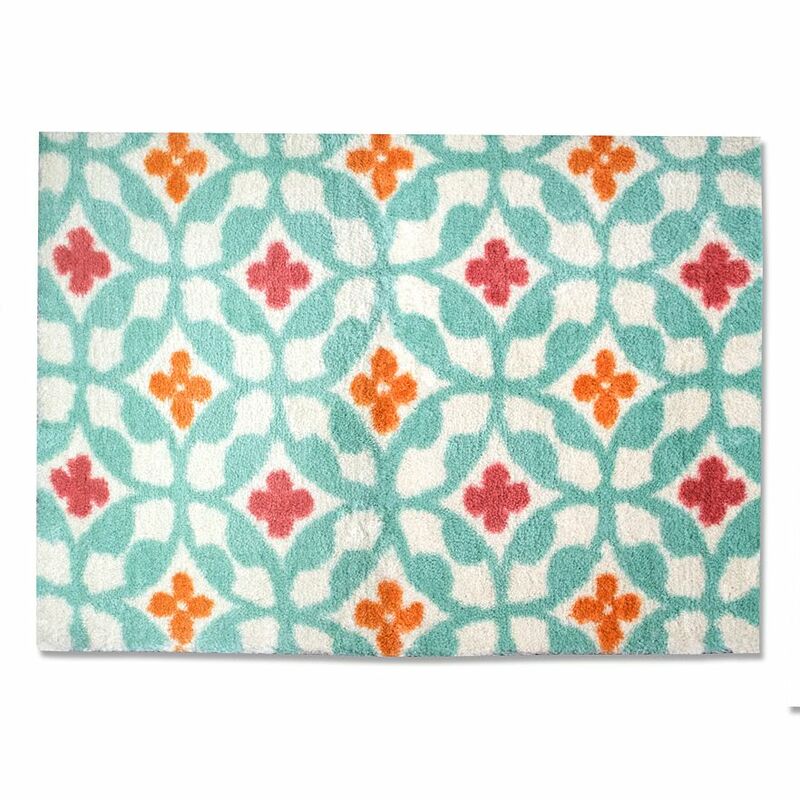 This luxuriousÂ Reversible Cotton Turquoise Bath Rug is crafted with an unbelievably soft cotton/viscose blend. Even better, itâ€™s reversible, with cut pile on one side and loop stitching on the other. 27″W x 45″L. $49.95. Buy here. 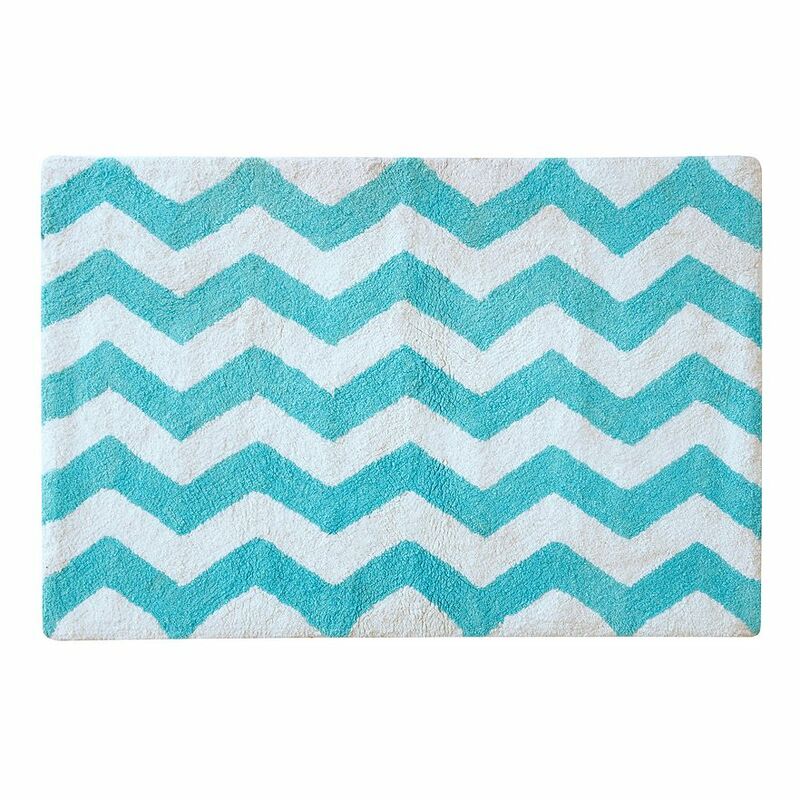 Update your bathroom decor with this Intelligent Design Aqua Chevron Tufted Rug. Made of cotton. Machine washable. $59.99 Sale $35.99. Buy here. When it comes to comfort and charm, itâ€™s all in the details. 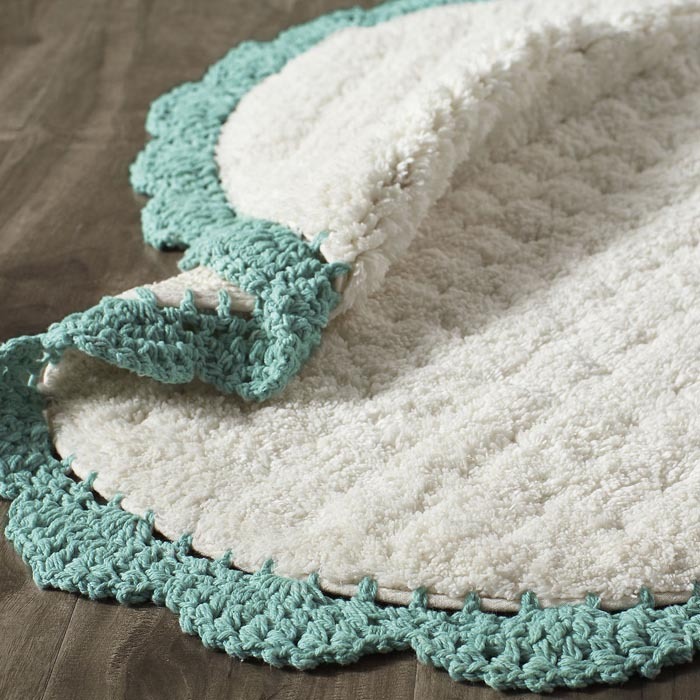 Which is why thisÂ Crochet Edge Teal Bath Rug features 100% cotton construction for excellent absorbance and a super-soft texture. The finishing touch? A graceful look afforded by its crocheted scallop edge. $24.95. Buy here. 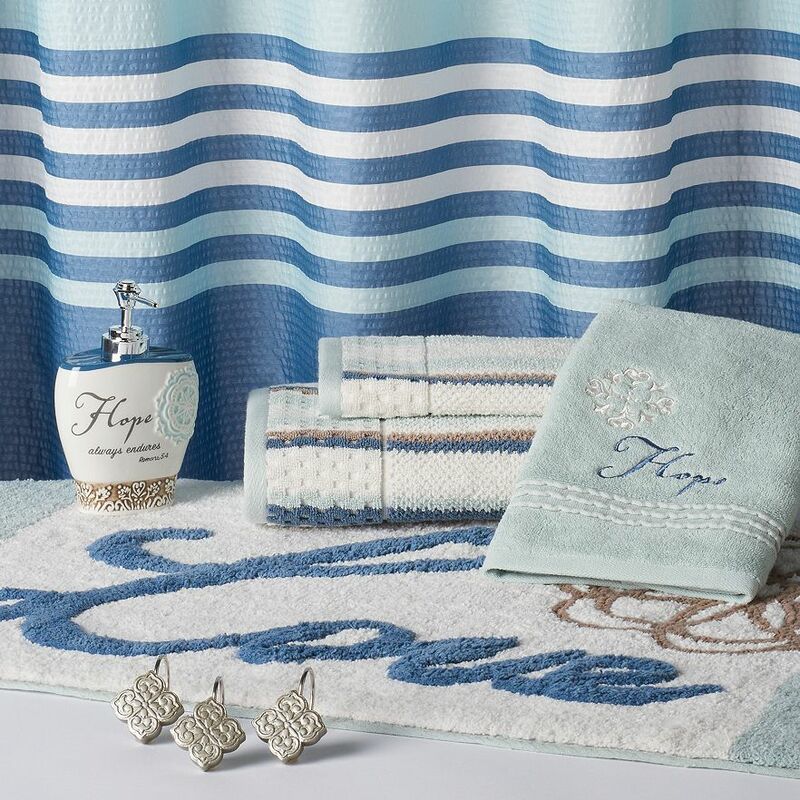 Give your bathroom a rug makeover with thisÂ Spa Blue Bri Bath Rug Collection featuring a variety of shapes and styles. $28-$85 Sale $14.99-$49.99. Buy here. 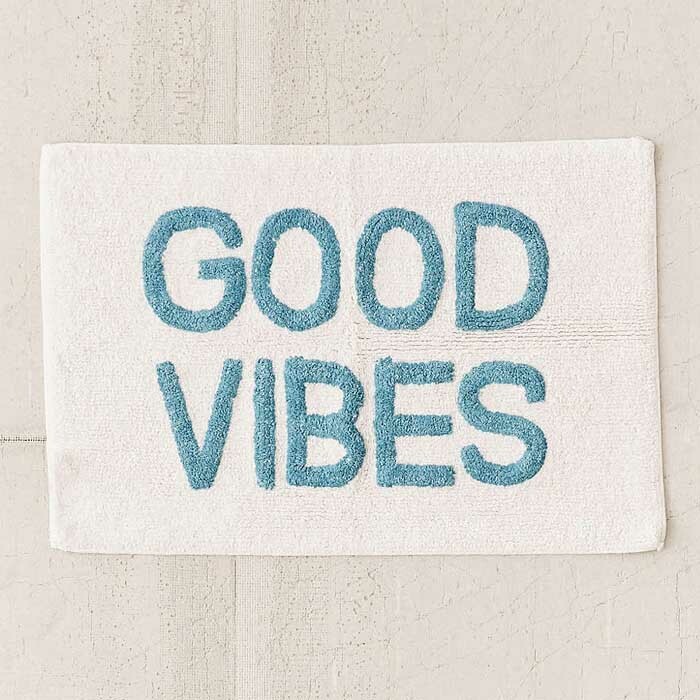 Get your good vibes flowing with this fun Good Vibes Tufted Bath Mat. Perfect for a quick update to your bathroom. $34. Buy here. 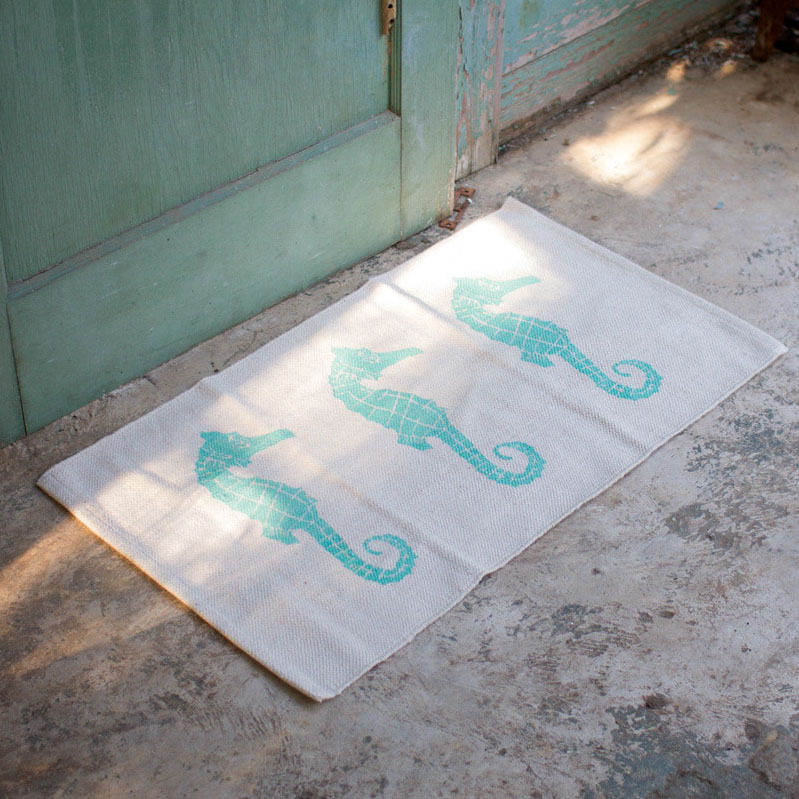 Made from lightweight cotton with a printed coastal design, thisÂ Cotton Seahorse Rug is the perfect size for the bathroom, kitchen, or entryway to your beach home or condo. $24. Buy here. 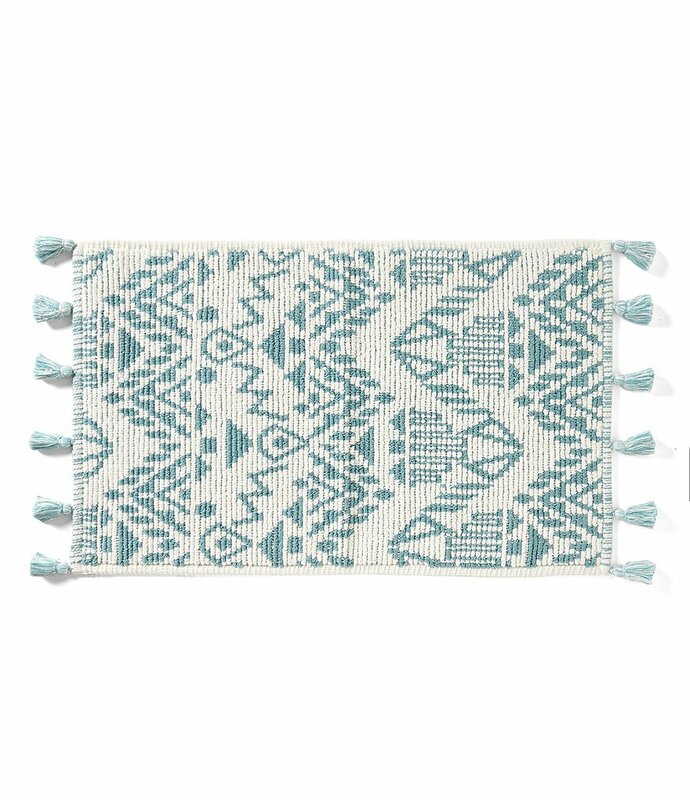 ThisÂ Fiesta Ava Bath Rug makes a strong style statement. Features a plush cotton pile and floral medallion motif. $50. Buy here. 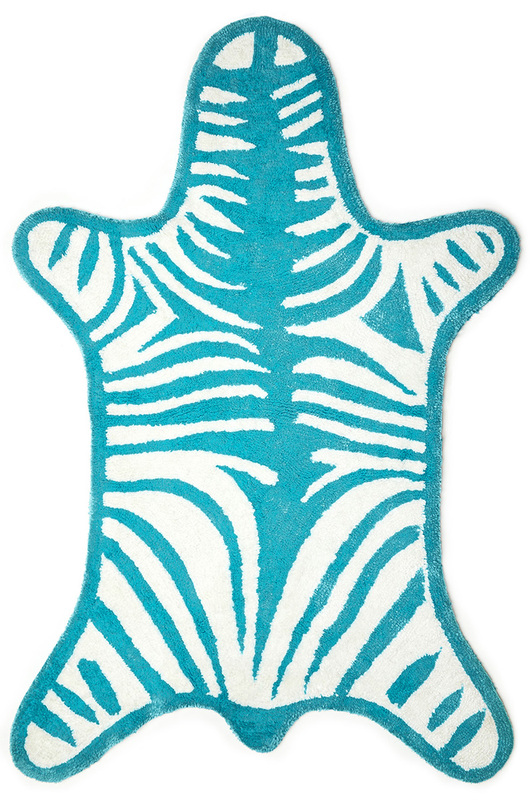 Luxe up your loo with this Reversible Zebra Bathmat by Jonathan Adler. Combining dense loops on one side and soft cut pile on the other, these bath rugs are as versatile as they are chic. 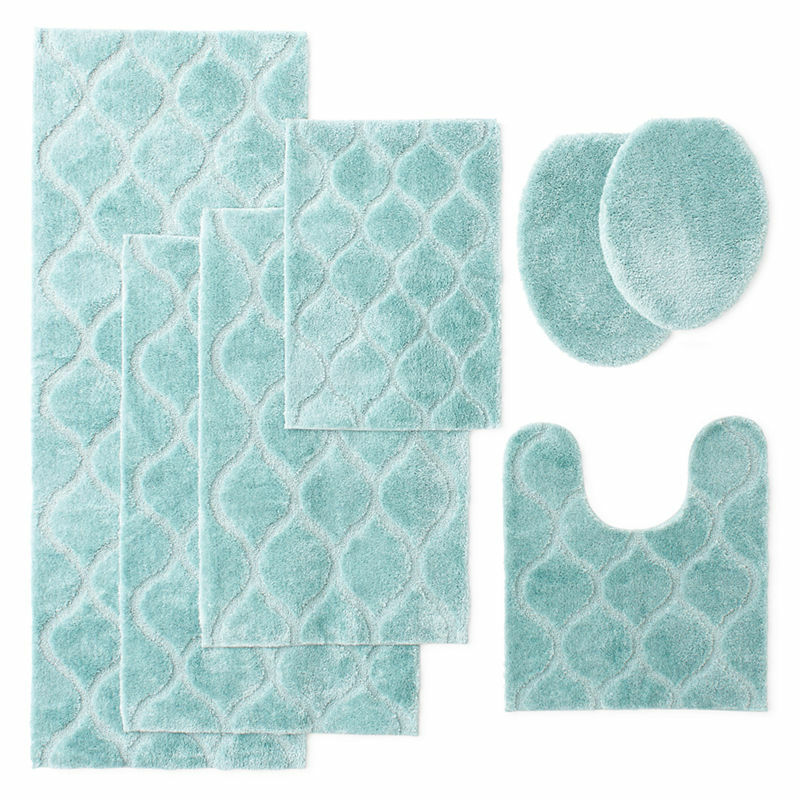 Both sides are plush, absorbent, and add texture and color to any bath. $88. Buy here.